Pirate Radio got its start in 1996 when Brentt Brown (guitar/vocals) and Ryan Keeley (bass/vocals) were randomly chosen to be freshman roommates at Bucknell University. After finishing college and recording an album of homemade four-track demos, they relocated to San Francisco and formed Pirate Radio with Brian Stein (drums). Vintagely recorded at Tiny Telephone studios with Aaron Prellwitz, Pirate Radio (2005) captures a band defining its sonic soul and musical core, one that would sustain them for a decade and counting. 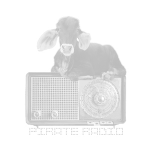 Pirate Radio has been a mainstay of San Francisco’s live music scene for over a decade. For booking information please email: pirateradiosf@yahoo.com.